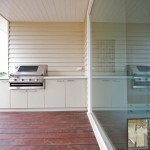 This Contemporary style home in Barwon Heads, Victoria showcases a simple but functional kitchen. 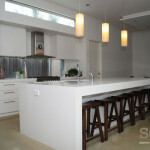 SCLK incorporated simple overhead cabinetry with no handles, with flat panel doors and slimline handles. 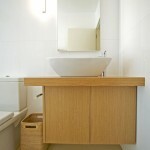 The thick square edge bench top is a major feature of the kitchen, other cabinets include a bookcase, WIR’s and TV unit. 13 pictures in this gallery.